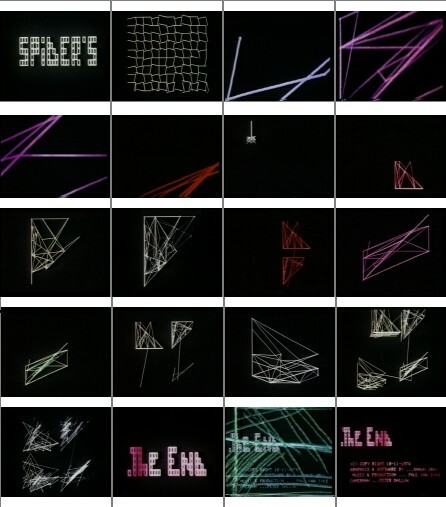 Prior to "Spiders" in Australia there had only been a few computing students' exercises and the odd television promo or film effect, but no computer graphic motion works primarily conceived as a work of art. Thus it is not all that extraordinary that this project that eventually became the first computer graphic 'Art Film' created in Australia, started life also as something else, an engineering problem. In my fourth and final year of my academic sculpture training, I was very taken by a then recently published documentation of Christo's 1972 "Valley Curtain" installation at Rifle Colorado. With site specific sculptures being all the rage we where set the task of developing proposals for plausible works, that given funding could realized with minimal delay. My dream was to to hang from a city sky-scrapper in the middle of the night a monumental spider's web sculpture (approximately 40m.high).. The local authorities did not care as long as I found an engineer that would certify the webs structural integrity. Random structures are incredibly difficult to engineer, just when I was about to chuck the idea I was shown a (what way back then was one of the first) catenary analysis computer programmes. Thus if I could discern an algorithm for the desired web then that in theory could be run lockstep with the catenary analysis. So to do this necessitated my learning of computer programming. Hardware for the job was in the form of a shinny new bunch of filing-cabinet like boxes that made up a Digital G44 Graphic System;- a 17" black & white vector-display, a PDP11/40 with all of 16K RAM (Random Access Memory) running the RT11 operating system. As for the computer-graphic software I learnt BASIC, then between May & November 1976, wrote a suite of little programmes that either took hours to generate parts of the display list. Finally the list of vector calls where played back in real-time for filming. Meanwhile as I started looking at what had been done by overseas artist with computers, which prompted my swapping the project target from a sculpture to a film. So later when I first saw "Permutations" (1967) by John Whitney, it confirmed for me what would be a significant chunk of my future aesthetic work should be. The film was shot on 16mm black & white stock then hand-coloured after processing before release printing. With improvised musical performances by couple of mates the sound track was done at Cumberland Street Campus of Alexander Mackie C.A.E. I did most of audio engineering, mixing then editing at the time using two Teac 4-track Simul Sinc machines and an 8 track mixer. The finished 1/4" audio-tape was transferred to 16mm mag. film then edited with image on a "Steenbeck". Click on the above block of thumbnails to view some more larger images ( frame-grabs). During 1977 I continued working with experimental video, exploring effects like chroma key, quantizers, colourizers etc. In November I was awarded a grant by the Creative Development Branch of the Australian Film Commission to complete a second film. Its contents is an exploration of symbolist imagery as an expression of a journey of mind and soul in a Art-Nouveau Dreamship through different presentations of a fixed staged reality. Rather than my previous strategy for Spiders of having friends improvise music to pre-existing footage, this time I hired three professional musicians to put down a jam session on the theme of a journey. Geoffrey Crane on keyboards, Richard Knight on bass guitar, with Kim Pentetcost on drums crafted about nine minutes of 8 track audio.. I created the dreamship (63.5 cm. (h) 106.7 cm(w) 88.9 cm(l)) from timber metal & fibreglass in my studio. The dreamship was shot with graphics and other effects onto 2" video. then edited down at T.P.F (Television Production Facilities Pty. Ltd Paddington) along with the 1/2" 8 track audio we'd created at Northsound Studio by combining the muso's jam with other effects. 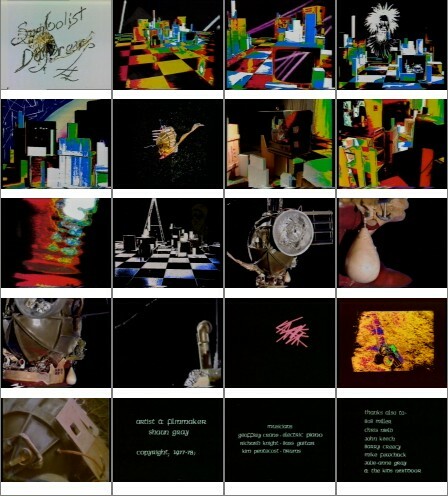 The final video to film transfer was done at Colourfilm laboratories in Sydney..
Click on the block of thumbnails to view some more larger images ( frame -grabs). See appendix 'B' for details of "SPIDERS" & "SYMBOLIST DAYDREAM" shows and prizes. Following the success of these first two experimental film ~ videos , I was subsequently invited to submit a new work to an international video festival in Amsterdam circa 1980. . Thus the Tri-Lingual Sci-Fi concept began a life of it's own some twenty years ago now. "ze incomplete Tri-Lingual Sci-Fi" ©. ;- a film story-board, a poem, a comic, in English, Arabic & Chinese.